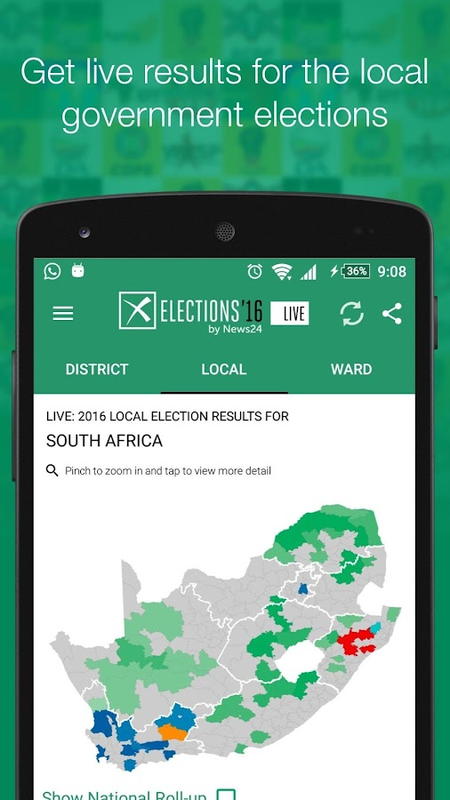 Stay informed about the 2016 South AfricaElections with the convenient News24 Elections app. 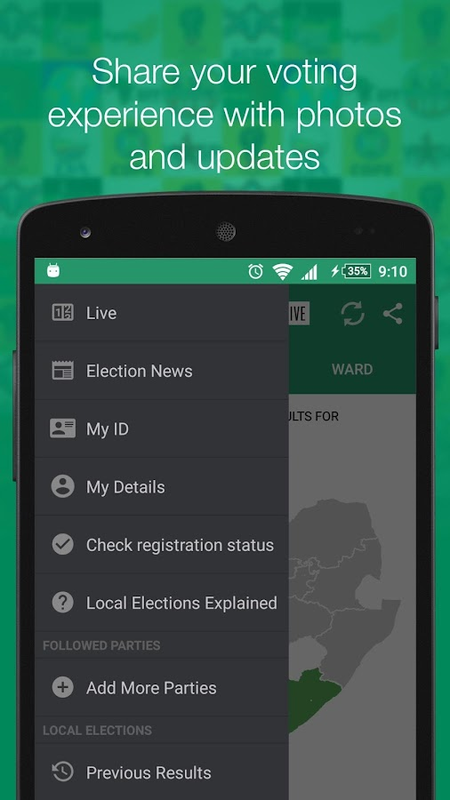 Download it nowand receive breaking news and in-depth features of your favouritedemocratic party, check the status of your registration, find yournearest voting station – and so much more. BREAKING NEWS. FIRST. Our award-winning team of journalists bringsyou quality breaking news as it happens. Whether you are lookingfor in-depth analysis, the latest in entertainment, sport, politicsor business you will find it in our News24 app! KEY NEWS24FEATURES: - Stay up-to-date with the best in breaking news, currentaffairs, political journalism, sport, technology, finance andentertainment. - Enjoy rugby, soccer and cricket live scoring,fixtures and results so that you never miss out on the sportingaction. - Be the first to know with breaking news alerts pusheddirectly to your mobile home screen. - Get all your weather,traffic updates and market indicators. - Know what’s happening inyour country with our focus on South Africa news. We would love tohear from you. Please send us a message in the app under Feedback. The most up to date database of load sheddingschedules in South Africa, brought to you by News24.com!- Search and save loadshedding schedules from across SouthAfrica using our extensive load shedding schedule database.- Customise your app for all your important areas - home, work,school, gym and more!- Browse advance schedules for the coming week so you can plan yourlives around possible outages.- Sign up for alerts for each schedule and receive notifications inadvance as to when load shedding will affect you next.- Report outages and errors in load shedding schedules to News24directly. Get breaking local and international news fromNews24, Nigeria's premier online news source.View the latest top stories, sport updates and entertainment news.The app also presents beautiful multimedia galleries plus you cancheck out your 5-day weather forecast. Stay informed and connectedwith News24 on your Android device. NetNuus is ‘n gratis, Afrikaanse nuus-app wat jou in 'n japtrap ophoogte bring van die jongste nuus waaroor almal praat. Die app isgemaak vir die van ons wat nuus vinnig wil lees, niks wil mis nieen nie verlore raak nie. Dis nuus wat saak maak: raakgevat. Wanneeriemand jou vra: "Het jy gehoor?"... het jy dit waarskynlik reeds opNetNuus gelees. Die app bied ‘n gerieflike leeservaring – wat onsdie gewildste Afrikaanse nuus app in Suid-Afrika gemaak het. Het jyiets op die hart? Wat dink jy oor wat in die nuus gebeur? Sê jou sêof reageer met ‘n gesiggie – maak soos jy smaak. Met regstreeksekennisgewings (“push notifications”) verseker die app dat jy geenstories misloop nie. Dis rolnuus vir almal. Ons app bied aan jou ’n magdom inligting: die beste nuus- enleefstylinhoud van die dag, terwyl die storie ontvou. Jy krydaagliks meer as 200 berigte oor brekende nuus, sport, leefstyl engesondheid, sake en persoonlike finansies, kuns en vermaak deurNetwerk24 se landwye verslagspan, asook meningstukke en ontledingsdeur voorste rubriekskrywers en kenners. Geniet eksklusiewefotogallerye, videogrepe en infografika, asook ’n weerkaart. Jy kryook nou daaglikse inhoud van die voorste Afrikaanse tydskrifte –Huisgenoot, Sarie, Kuier, Tuis, Weg! en Weg Ry & Sleep,Landbouweekblad, Finweek en Baba & Kleuter asook die inhoud vandaardie week of maand se papiertydskrif in webformaat sodat jy ditmaklik op jou selfoon of tablet kan lees. Subskripsie: Die app isgratis om af te laai. Om ons premium-inhoud te kan lees, moet jy ’nNetwerk24-intekenaar wees en aanmeld met jou Netwerk24-besonderhede(e-posadres en wagwoord). Is jy nog nie geregistreer nie? Doen ditsommer nou in die app of op Netwerk24.com en kry ’n GRATISproeftydperk van 30 dae. Nadat die proeftydperk verstryk het, salgeregistreerde gebruikers betalende gebruikers moet word om verderte kan lees. 6.9MB, FREE to download and uses less data than any other mobi siteto bring you all your favourite stories from Soccer Laduma, KickOff, Daily Sun, Sport24 and more!!! Get the Daily Kick app now forall your soccer, news, live scoring, results, fixtures, logs and tofollow your favourite local and international teams! You will nevermiss out on any Soccer action with Daily Kick. You don’t need tospend extra time or data visiting all your favourite sites to findthe stories you want to read! They are all in one app. This is whatmakes Daily Kick the best soccer app!! 6.9MB, FREE, DATA LIGHT APP★ Free to download. No more visiting multiple soccer sites. Pluschange your image settings to use less data. SOCCER + NEWS IN ONEAPP ★ All the latest transfers, rumours and gossip from SoccerLaduma, Kick Off, Daily Sun plus 1000’s more! FOLLOW YOUR TEAM ★Follow your favourite local and international teams and never missout on the action. LIVE SCORING + MORE ★ Get results, fixtures andlogs for all your favourite soccer leagues. Including PSL, EPL andmore. PERSONALISED ★ Choose your interests and get the stories youwant to read! With a 4.6 start rating, our users LOVE Daily Kick: ★“I love the update of all the best games of South Africa. I don'tmiss anything when comes to soccer.” ★"Gud app don't have to buymagazines and newspapers anymore and it keeps mi up-to-date with myfavorite sport football" DAILY KICK ALL YOUR SOCCER. NEWS. LIVESCORING IN ONE PLACE!!! THATHA ZONKE!!! 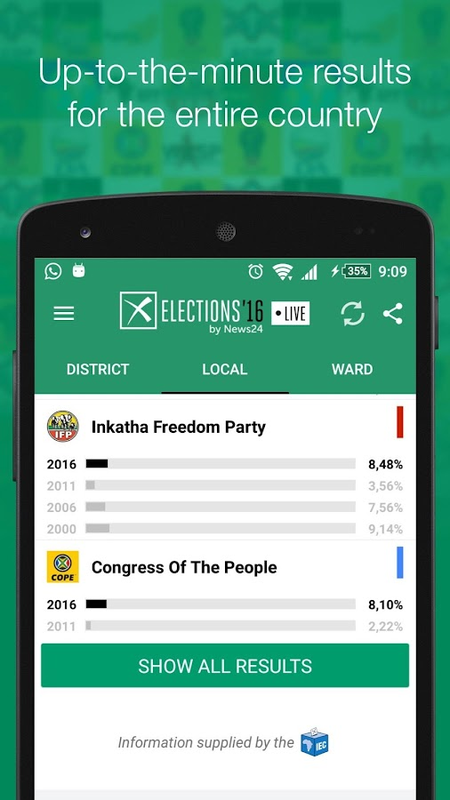 The official election app of the Electoral Commission of SouthAfrica. Check your voter registration details, apply for a specialvote, and get real-time results for upcoming elections for yourward and party. Download it for FREE now! Key Features:- View yourregistration details, including registration status and votingstation information- Navigate to your voting station- Apply for aspecial vote- View your voter status, ward councillor and specialvote status- Celebrate your vote - Share key election moments- Viewyour candidates- Set your notification preferences for results-News and information on the election processes, as they happen-View the IEC’s contact information and address- Report a votingstation issue- Follow the IEC’s social media feeds on Twitter andFacebook to keep up to date with developments as they happen. Read the most popular newspapers from South Africa.South AfricaNews brings you the most popular newspapers from South Africa inEnglish and Afrikaans. This is a fast and easy way to read thelatest news. No unnecessary features, we keep it simple to you!-Most popular newspapers.- Automatically download latest news.-Really fast app, and it won't drain your battery.- Try our RadioSouth Africa app soon!- South Africa News, Newspaper, Journal.Theseare some of the available newspapers:- News24- IOL- MyBroadband-SuperSport- Bizcommunity- Sport24- Times LIVE- Fin24- Mail &Guardian- BBC- Daily Mail- New York Times- C N. E T News- Goal-Business Day- EWN- Wheels24- Sowetan LIVE- SundayWorld- City Press-SABC News- Rapport- WeatherSADo you want other newspaper on thelist? Do you think that some newspaper should not be on the list?Need help? Write us [email protected] the most popularnewspapers from South Africa, get South Africa News now! The Ultimate 2016 US election app! Followthe2016 Presidential Election with the latest news on debatesandprimaries. Get the complete 2016 debate schedules forRepublicanand Democratic candidates with details and pushnotifications.Features:-Push notifications of debate times and debate videos-Links to Debate Live Streams & Full Videos-Latest 2016 Presidential Debate News-2016 Primary Schedule-2016 Delegate Count-2016 Primary Debate Schedules (Dem & GOP)-2016 General Election Debate Schedule-Debate Ticketing InformationThe grand 2016 Election app dedicated to debates, primaries,andall the useful information you can't find organizedanywhereelse! 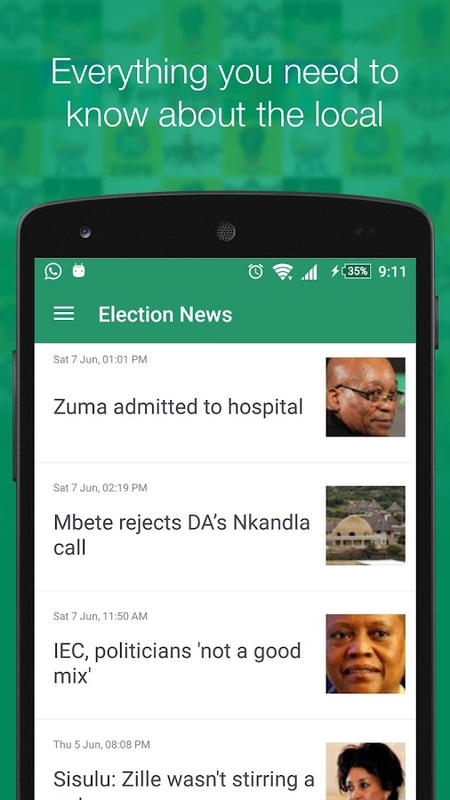 The eNCA mobile app delivers the latest in news, politics, sport,weather and business. Featuring up-to-the-minute alerts, videos,photo galleries and in-depth analysis produced by South Africa’sleading independent news network, the eNCA app will keep youinformed and engaged in the stories shaping South Africa, Africaand the world. Use the News Stream to watch breaking news, orexplore the extensive video section for exclusive online content.You can also catch up on anything you may have missed on eNCA TV.You deserve to know more. Dubbed ‘The People’s Paper’, Daily Sun is thebiggest (and loudest) daily newspaper in South Africa. With itstargeted delivery of current affairs, sports, community news andsupplements, Daily Sun offers news of the people, to the people! Inprint and online, Daily Sun’s unique voice represents the heart ofthe nation.